London is a massive city with so much to offer, it is impossible to list everything. But what I can do is list a few of the places where I have spent time shopping and eating in London. I can also try to share a bit of information on what is available and what you can look forward to. The options for shopping and eating in London range from incredibly cheap to incredibly expensive. You can also find something from every corner of the world. It really is amazing. You can choose to eat at a pub that is several hundred years old, or an expensive hotel restaurant that is also several hundred years old. How about eating food from a country you have never visited, or maybe just stick to eating something more within your comfort zone. Try the London invention of afternoon tea for the first time, or enjoy a kabob at the end of a night of drinking just like the locals. Maybe you would prefer to just shop for groceries at Tesco’s or Sainsbury’s. 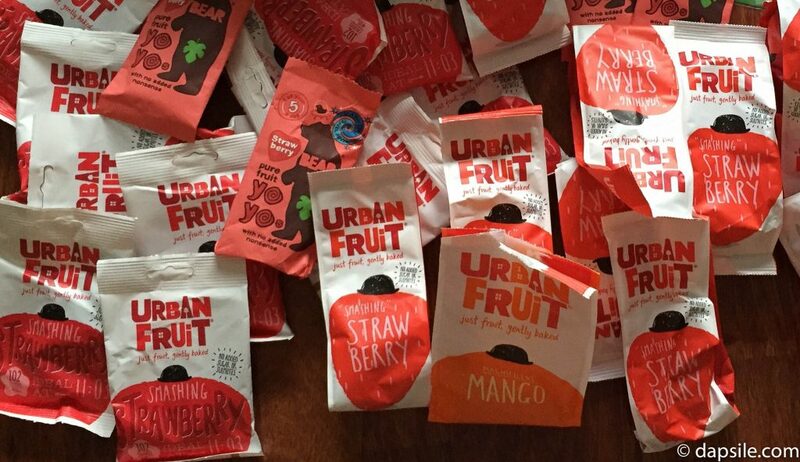 Like these Urban Fruit (website) treats that are healthy, chewy, and basically candy-like. They are 100% fruit with no added sugar or sulphites, just baked fruit. I ate them every day and brought a huge amount home with me. To say I loved them is a bit of an understatement so I highly recommend them. Some of the Urban Fruit treats I brought home from London. If you are a reader, one option is visiting Hatchards on Piccadilly; London’s oldest bookstore at over 200 years old. Next door to it is Fortnum & Mason which for over 300 years has been supplying people with wonderful food and even picnic supplies. How about walking along Regent Street between Piccadilly Circus and Oxford Street. Or walk down Oxford Street. You can spend a day shopping in amazing but also historical shops like Hamleys toy store, as well as Liberty, Debenhams, and Selfridges department stores. And just on the other side of Hyde Park is Harrods. Those shops are only a few of the big, famous names you might recognize. You could also mix shopping and eating in London with history at the same time and visit one of the many markets. There really are an endless supply of options. 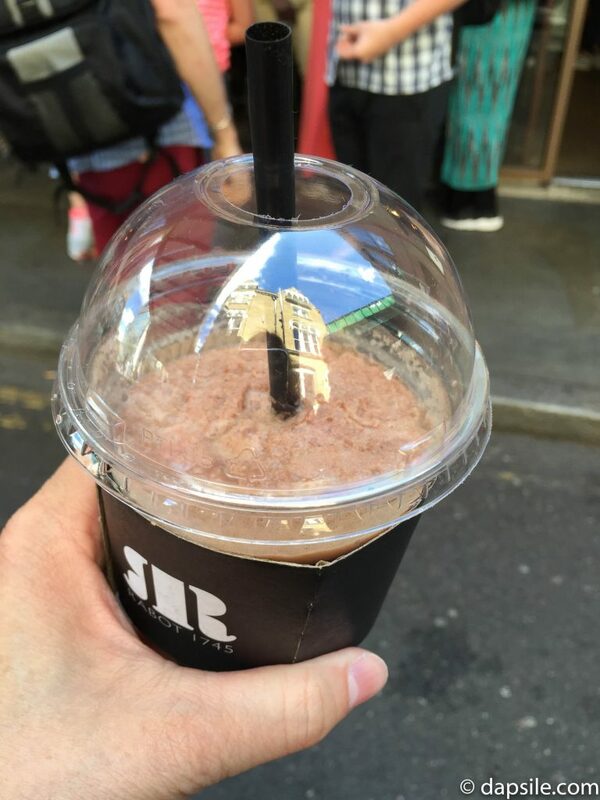 With such an overwhelming selection for shopping and eating in London, I’ll share my choices from my last visit. The markets in London range from enclosed shops to covered, tented stalls to just tables. They offer everything from food to clothes, to flowers, to antiques, to even what some might consider junk. There are so many markets for you to choose from to do some shopping and eating in London. Markets have been surviving as a shopping option in England for more than a thousand years so it’s not really a surprise they offer so many different ones to visit. Some of the more famous ones are Covent Garden, Portobello Road, and Camden Lock, but there are so many more. I’ve been to several but my most recent trip to London had me visiting Borough Market for the first time. Located across the street from the London Bridge Underground station, Borough Market (website) is an amazing food market that celebrated their 1000-year anniversary a few years ago. Nobody knows exactly when it was first established but the 1014 date has been used because of a story talking about the great market town of Southwark. Which is where Borough Market is located and now part of London. The website calls the market Britain’s renowned food market and from personal experience I can say, this market is like a foodie’s dream. There were food vendors of all types. Produce, spices, cheese, breads, meats, condiments, and almost anything else you can think of. I even bought an amazing vegetarian pate. Oh, and don’t forget the wine and other alcohols. The busy market is an amazing sight even if you aren’t a foodie. There were vendors selling delicious street foods, some selling candies from other countries, and even shops where you could taste wines before purchasing. It’s a bit of a different place where you can do some shopping and eating in London but you also get to meet the farmers growing the produce, the fisherman who caught the fish, or the person who created one of the many different artisan products because they are the people working many of the stalls. It really is an experience. There are also several restaurants in Borough Market for you to enjoy but we went to the chocolate one. 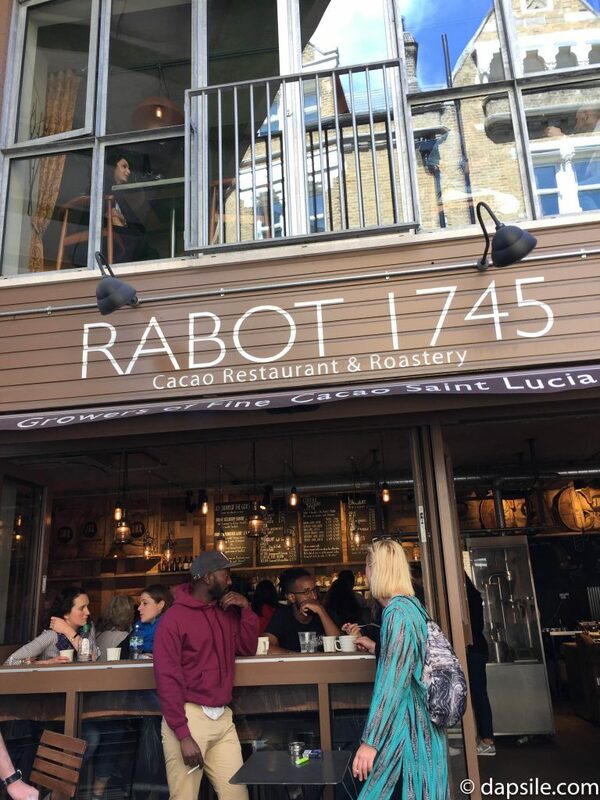 Located in Borough Market, Rabot 1745 (website) tantalizes patrons with food, drinks, desserts, and treats to take home, all using cocoa. It was a wonderful, delicious find. It was also the very first time I had a frozen, blended chocolate drink, and now I love them. Rabot 1745 is a chocolate lover’s restaurant where customers are served chocolate products from different locations around the world. Chocolate really does taste different from each country and this restaurant lets you try a lot of it. Not everything on the menu contains cacao but a lot of it does. Like I said, I really enjoyed my frozen, blended drink but I also enjoyed the chocolate bars I brought home with me. Both the market and the Rabot 1745 restaurant were packed busy. Again, a location where I can do some shopping and eating in London, at the same time. Cath Kidston (website) carries clothes, handbags, travel bags, wallets, items for the home, kitchen, children, and even babies. They have a huge selection of stuff in their flagship store on Piccadilly. That location is also open for like 10 hours almost every day too so it makes it easy to shop. The styles tend to be floral, animals, and characters. That kind of thing. Which works for me because I seem to have some sort of unconscious obsession where every time I travel to a foreign country, I buy myself something floral. While Cath Kidston has many locations, none of them are located in North America. Actually, in any of the Americas. I didn’t even know about the brand until this trip. I saw a really cute handbag being carried by someone on the tube and noticed the name. So, it meant I had to go shopping. I have one complaint with Cath Kidston and part of it is probably related to my country of residence. After using a handbag I bought only a few times over a several days, a piece on one of the handles started to fall apart. I was back in Vancouver by then but I still contacted them regarding a return because I had bought the bag less than a week before and had only used it like two or three times. It grew into an ordeal. Apparently, it costs more than they were expecting to ship something from Canada to the UK. Emails went back and forth and it took quite a while but finally, everything moved forward and they replaced my handbag. I was happy they were willing to help me with the defective product but I wish it would have been quicker and less of an ordeal. The second bag took months of use before the same problem happened again. It wasn’t anything major enough to complain about a second time though (it was a rubber filler in the seam of the handle) so I’ve been living with it. I was happy with the product, the selection, and my experience so I will shop there again. Our first day in London was July 1, 2016. Canada Day. So, we decided being in London for Canada Day was the perfect time to enjoy our very first afternoon tea. And what better place than the British Museum. I’m so happy we did this. 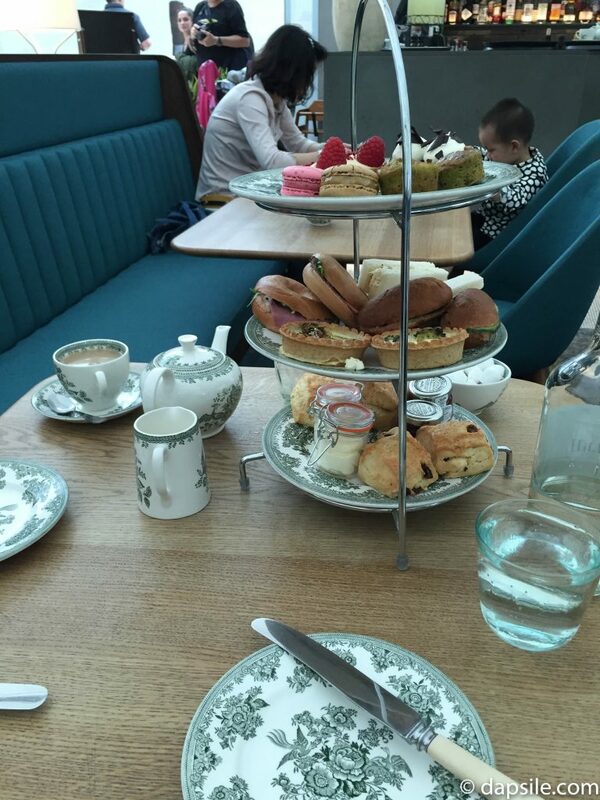 While having afternoon tea would have been delicious and a great experience at any of the famous, historical locations normally associated with it, for two museum lovers like us, this was an awesome memory. Also, the afternoon tea at the British Museum was the most affordable option of all the ones we looked into that day. If shovelling your face with mini sandwiches, scones, desserts, and tea is not your thing, (I’m not saying you’re crazy, but really?) they also serve other foods. The Great Court Restaurant (website) is located under the beautiful glass roof of the Great Court, at the top of the spiral staircase. It has an open kitchen so you can watch the chefs, and it even has a bar. It’s quite a bright location under that glass roof even if it is a bit loud being in the semi-open court. But just eating my first afternoon tea in a large, stunning museum made me happy. Bonus, now I am also slightly addicted to afternoon tea and even found a delicious vegetarian one in Victoria, BC. My cousin Megan watched a TV program here in Canada on the Food Network YouTube channel from Crumbs & Doilies Cupcakes (website) in Soho, London. So of course, we had to go to the shop for cupcakes. Located on one of London’s many cobbled walkways, it is between Beak Street & Kingly Court just off Carnaby Street in Soho. They were a bit difficult to find for anyone not knowing the area because it really is a walkway between streets and the GPS on our phones had issues. But it wasn’t the only shop there and it is a cool location. I’m glad we made the effort to find it instead of giving up. Crumbs & Doillies had quite a selection of regular size and mini cupcakes, as well as cakes. What they have in stock changes daily also so you will always be surprised. 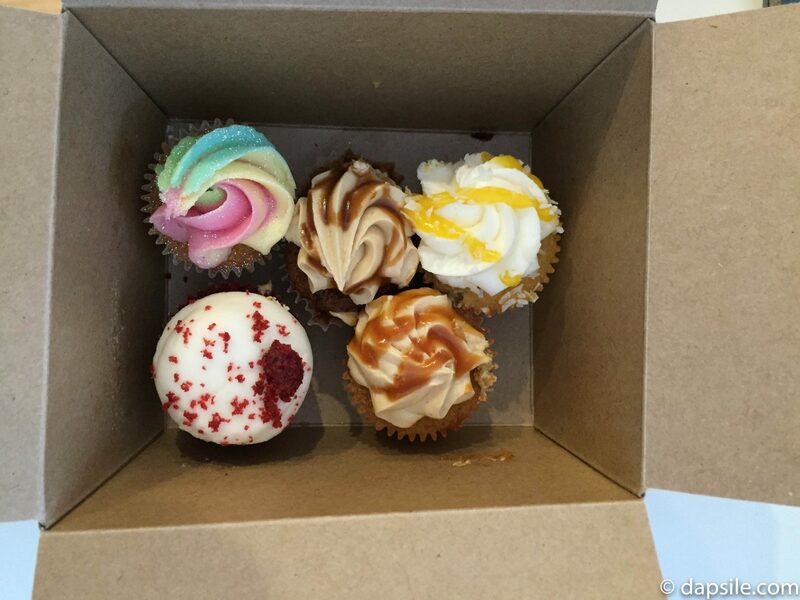 I had just started eating sugar again and it was my birthday the next day so I kept it simple and bought an assortment of five different mini cupcakes. Of course there was a caramel option for me cause it is my favourite, but the rainbow one with glittery sparkles looked the most fun, unicorn-like, & pretty. All were a sweet, delicious treat though. Where else other than the UK are you going to find a Chocolate Guinness flavoured cupcake or a Lavender Caramel one? How about trying a Malteser, Cinnamon Toast, or Buttered Popcorn flavour? You could always go with some more common ones though if you prefer. Like Salted Caramel, Vanilla, Chocolate, or Red Velvet. You can order from them online to get your specific choice or you can take a chance and be surprised with what they have for sale in their shop when you walk-in. Not only does Soho offer quite the assortment of shopping and eating in London options but it is also located between Oxford Street, Piccadilly Circus, Regent Street and Leister Square. So it is a wonderful location to visit so many other places. I’m not sure what I was expecting from this restaurant by Jamie Oliver. I had never eaten at a restaurant owned by a famous chef before, or even someone I watched on TV, so I might have set the bar pretty high. Which could explain why I wasn’t overly impressed. Don’t get me wrong, the restaurant was very nice and the food was good, but it just didn’t jump out at me as anything better than other restaurants I’ve eaten at. 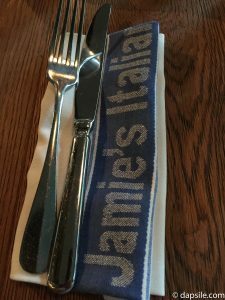 We visited the Jamie’s Italian (website) London Bridge location which is in the Hilton London Tower Bridge hotel. It allows the restaurant to have longer opening hours which means they also serve breakfast. We were there for dinner though and one place the restaurant excelled at was the vegetarian options. I really appreciated the large selection on the menu. Some of the choices even had protein which is not always an option with vegetarian meals in most restaurants. There are locations in Piccadilly and Covent Garden too. These are a few of the places I visited for shopping and eating in London on my last visit but this is an enormous city with what feels like endless options. I didn’t even discuss the pubs. Some are new and centered around the tourists while others have been at their location for hundreds of years. London has so many things to see and do but even if you only have a few days you will be able to experience so many things. Have you also recently been to London? Do you have a few suggestions on where to go for shopping and eating?